I’m afraid to click on things on the internet. I have been an avid user of the interwebs since…well, as long as I can remember. Which makes perfect sense as a 27 year-old “millennial” who grew up on it. My dad and I ran a family business for nearly ten years so, naturally, using the internet was a big part of our marketing strategy. And as a web designer and online marketer, the internet and I have now reached such a level of steady commitment that you may as well save the date and be prepared to receive a wedding registry in the mail soon. What I’m trying to say is that I am very comfortable using the internet. And yet, here I am, afraid to click on things. I’m afraid because so-called online marketing “experts” and publishers have broken my trust. When I click on a link to someone’s content, I don’t know if it will be the answer to my question, a useful resource, or even worth my time. But it obviously caught my eye, and I’m willing and ready to check it out. There is, however, one thing I am very sure of. If you’re searching for something online, you will run into popups. These popups will range from incredibly annoying to downright absurd. The goal of these popups from a marketing perspective is made abundantly clear. But the real insanity lies in how these popups are delivered. Let’s look at some examples of what essentially amount to internet-based war crimes. Kudos to slapping a picture of a cute girl laughing on there too. That’ll get ’em! These might be the worst offenders of all. It’s one thing to attempt to build your email list by getting visitors to subscribe, it’s another to try to push people into sharing your content on social media. If I thought that your post was worth sharing, I would have clicked on one of the dozen or so share buttons plastered around your page. Worse yet, this particular popup displayed while I was still reading the article. How can I know if it’s worth sharing with my audience if I haven’t even finished consuming it yet? This is 100% real. No photoshop. In doing some research for this post, (I do try to be informed when I rant) I came across this post: In Defense of the Email Popup. Before I even had the chance to start reading why this writer felt that email popups were valuable to both bloggers and readers, I was bombarded with not one, but two popups. In fact, let’s take a look at that screenshot again, but this time we will blur out all of the pushy ads and focus on the actual content of the article. After blurring out all of the nonsense, saying that 30% of the screen was actual content would be generous. And the sad thing is, it’s a great post. After closing all of the popups, I went on to read it anyway, and the writer makes some great, data-based points. And obviously his content is resonating with his readers, as this post is listed on the first page of Google for some very competitive keywords. But his brand is now irreversibly damaged for me. In my future research endeavours, I will make a special effort to avoid his content. Simply because I know just how annoying the experience on his site is. It’s embedded in my brain. And there are MANY other sources of similar content I can use instead. Online marketing is an incredibly competitive niche. And for what? What was the point of all this? A 5% conversion rate on popups is widely considered to be very successful. 95% of your leads saying NO is success? In how many other industries is that acceptable? On top of that, there’s plenty of data to suggest that those who convert on popups are far less engaged than those who convert via other channels. And really, that will be true of any incentivized marketing strategy. People are subscribing because you’re giving them something for free, not necessarily because they enjoy your content and want more. In most case studies I’ve read about the MASSIVE increase in subscribers, they never show data on how many visitors unsubscribed once they got what they wanted. Or how many even open the emails they receive. Having 100 engaged followers will always be far more valuable than 10,000 followers who just don’t care. So… does this mean that you should never use popups on your blog in any context? What’s a proper strategy to build an email list? 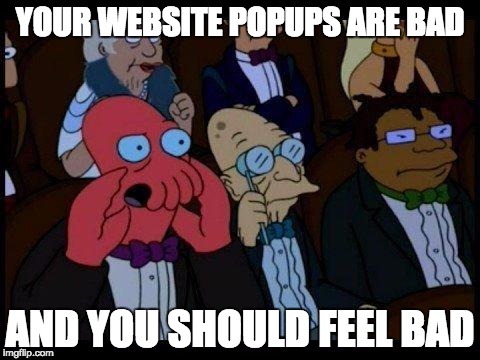 Let’s start with the things you should never do when using popups on your website. Had an emotional reaction to it. Found it to be useful. So if you want people to share your content, make shareable content. Easier said than done but, hey, nothing worth doing in life comes easy. If they like it, they will find your share button. Trust me. If you’re going to use popups, use one at a time. Always. Bombarding your audience with numerous popups is a surefire way to get them to leave and never come back. You can customize and test a variety of different popups throughout your site, just make sure you only use one per visit. You want people to stay on your site, and if you have a new popup on every single page they visit, they’ll peace out real quick. If you manage to actually get someone who’s ready to convert on your popup, the last thing you want to do is scare them away by asking for too much information up front. I can’t tell you how many email newsletters wanted my full name, the company I work for, my role in that company, the name of my first hamster (ok I made that one up), and even how I found their content in the first place. You need their email. That’s it. This one is just nuts. There’s some new technology on many internet browsers that allows publishers to send you push notifications straight to your computer, similar to the notifications you get on your phone. Yah, you know, those annoying notifications that nobody wants. It’s already hard enough to try and get people to give you their email without sounding pushy, but asking for permission to freely send them notifications on their phone or computer? You know the feeling. Being faced with an unwanted popup and not being able to find that DAMN X BUTTON. 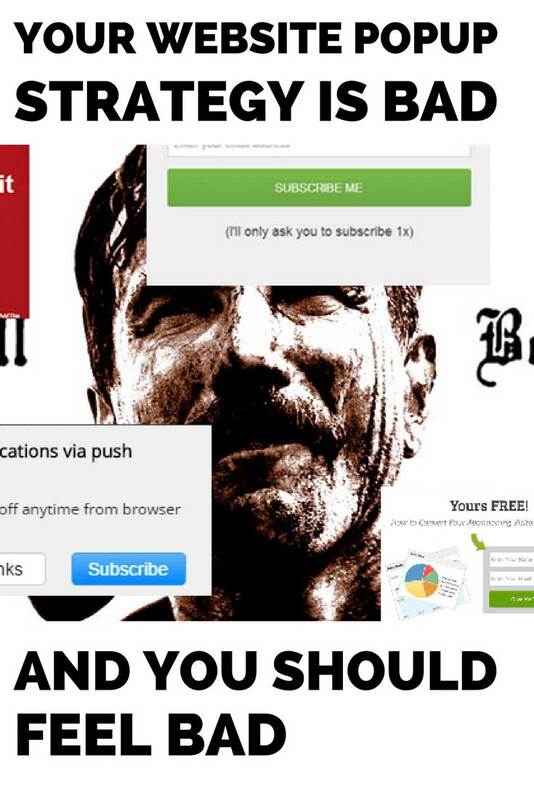 Don’t make it hard to say no, close or opt-out of these popups. If you genuinely have content worth following, they will be happy to do what you ask without you trapping them there. Use browser cookies to ensure that when a user says no to one of your popups, it won’t be shown to them again. Remember, your goal is to get these people to come back to your site again. Being pushy every time they visit will have the opposite effect. 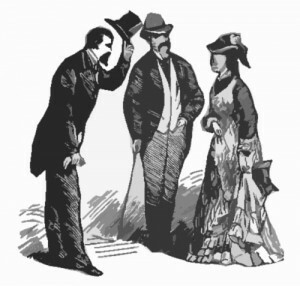 Don’t bombard the visitor as soon as they show up to your site. Give them a chance to read and view your goodness. Save your popups for when they’re done reading your post. Better yet, use something called “exit intent” technology. It only pushes a popup when it detects the visitor is about to leave. Most major popup plugins offer this. Not only will you ensure that your content gets in front of more eyeballs but, when they actually receive the popup, they will be much more likely to convert. This will result in a higher conversion rate, and more engaged followers. The reality is every niche, audience, and industry is different. What works for some will be infuriating and pointless for others. Test a wide variety of different pop up and opt-in strategies and see which one works best for you and your audience. Don’t blindly copy someone else just because it appears to have worked for them. Once you’ve actually managed to get someone to subscribe, make sure you’re sending them follow up content that is relevant to the reason they signed up in the first place. If they subscribed after your amazing article about custom Pokemon socks, don’t email them content on how to build bird houses. As you’re building your blog and creating content, always put yourself in your visitor’s shoes. How likely would you be to share it with your friends? How badly would you want to put your fist through your computer screen to clear away the popups? Your ultimate goal of building an online brand is to create something that keeps people coming back to you. That’s the whole point of any marketing strategy, including email popups. If you want your visitors to keep coming back, that experience needs to be stellar. The internet is too crowded as it is to waste time on mediocre content. And as far as I’m concerned, the internet would be a much more enjoyable place without a constant stream of annoying popups. What do you think? Are you pro or against the controversial website popup?